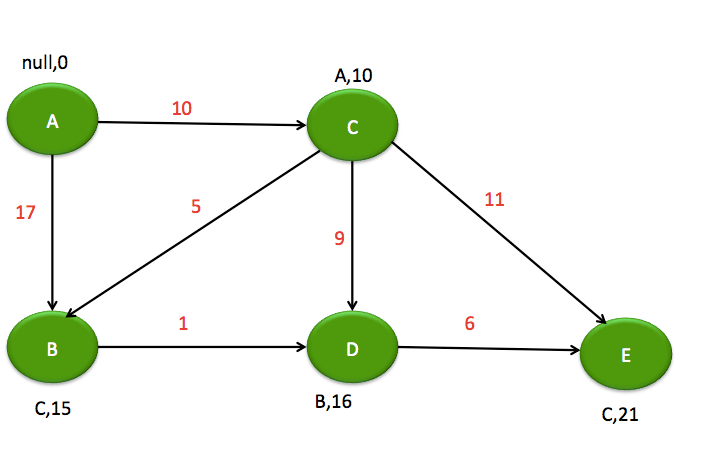 In this post, we will see Dijkstra algorithm for find shortest path from source to all other vertices. You will be given graph with weight for each edge,source vertex and you need to find minimum distance from source vertex to rest of the vertices. 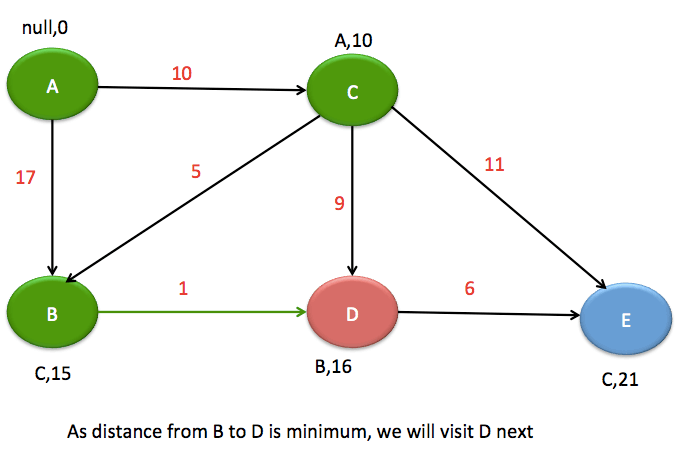 There will be two core classes, we are going to use for Dijkstra algorithm. Vertex: This class contains name, visited flag, predecessor(To track the short path, so that we can backtrack) and distance from source node and also the list of outgoing edge from this vertex. Edge: This class contains Source vertex, target vertex, and weight. Let’s first understand how are we going to solve it visually. As you can see, we have initialized predecessor and minimum distance to default.Green node represents visited nodes and red color represent neighbors of the vertex. As distance from C to B is minimum i.e 15, that’s why we have chosen vertex B as next vertex. As you can see, we are done with Dijkstra algorithm and got minimum distances from Source Vertex A to rest of the vertices. Let me go through core algorithm for Dijkstra. Set distance for source Vertex to 0. Set distance for all other vertices to infinity. 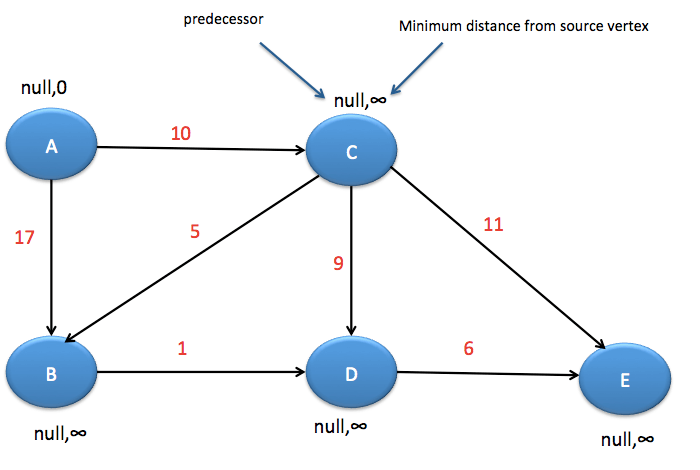 At each vertex, we need to choose a node with minimum distance from source vertex and we are going to use priority queue for that. Add source node to PriorityQueue. Poll vertex (Let’ say vertex A) from the PriorityQueue. Iterate over neighbours(Let’s say Vertex B) for the vertex A. 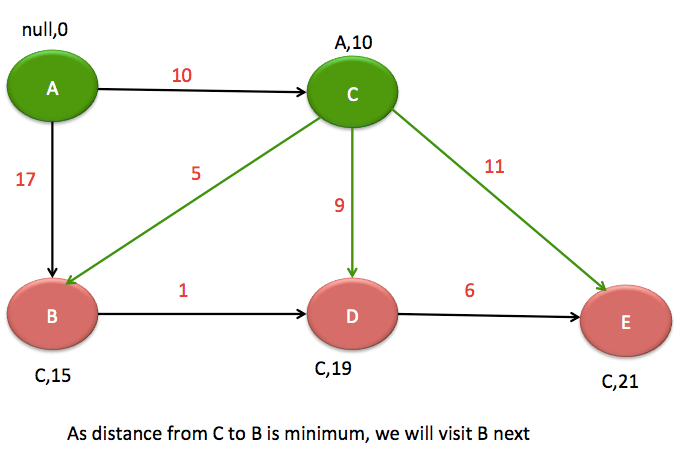 If new distance < Vertex B’s current distance then update the node(Distance,predecessor) in PriorityQueue. Create another class named Edge.java as below. Create another class named “DijkstraShortestPath.java” as below. This will contain main Dijkstra algorithm. Create another class named “DijkstraMain.java”. This class will contain main function to run the algorithm. 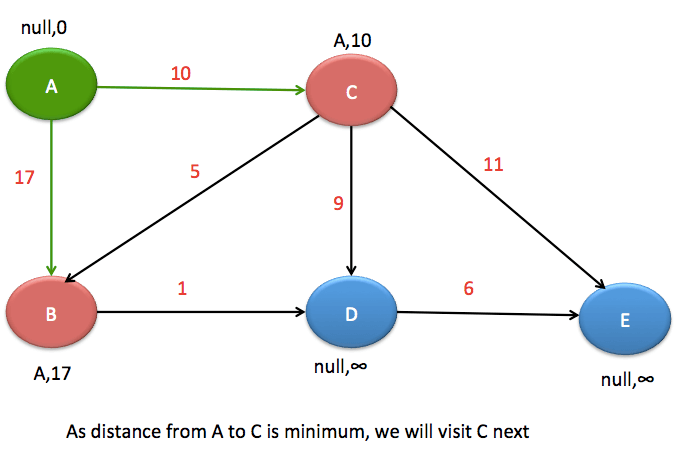 That’s all about Dijkstra algorithm in java.